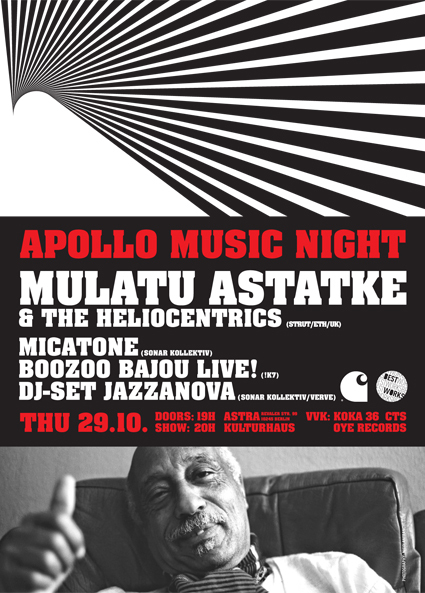 But even if not – the Apollo Music Night features an excellent line-up in the name of the rich Funk, Soul and Jazz history, that would fit perfectly into the calendar of New Yorks tradition-steeped live club for afro american music. With Mulatu Astatke, the great innovator of ethiopian Jazz from the sixties and seventies, and the british free-thinking collective The Heliocentrics, the headliners are a blueprint of profound Jazz influenced future music. In contrast the south German duo Boozoo Bajou, who will play also live, likes it the laidback way. Although their grooves are not so heavyweight, their music is fertilized by old Jazz and Soul traditions too. The third live act is the Berlin based Nu-Jazz band Micatone, who will introduce their brand new stage program. To perfect the night the Jazzanova DJ team will spin at the aftershow party to give all Jazz cats a lift.